There is plenty of inspiration for the creative visual Artist living around Royal Leamington Spa. A plethora of scenic beauty can be found in the leafy County of Warwickshire where Kevin lives. 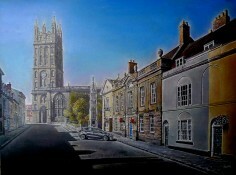 It leaves the creative Artist spoilt for choice trying to decide what scene to paint next, architecturally or otherwise.